Bake a 20x20cm (8″x8″) square cake. Then cool, cut off the top, turn it upside down onto a board. fill it. 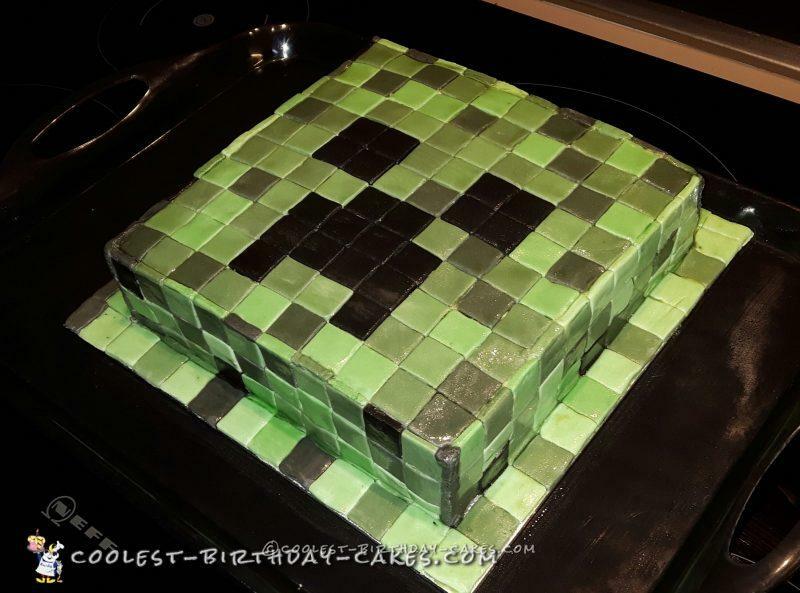 Put buttercream around it (you can colour it green if you want). Leave it in the fridge to harden up the buttercream. Mix Tylo powder to some of the black icing and roll out in small batches. Use cornflour to prevent it from sticking. Use a thickness gauge! The Tylo powder helps to stiffen it. Use a square cutter (~1 inch) and cut out at least 20 squares. Mark out the center lines of the cake (I pressed a bamboo skewer length way along the center on the buttercream icing). The top of the nose is below the center line and the eyes above. You can use the picture as a guide. use the cutter to gently mark out where the ’tiles’ go over the whole top surface. 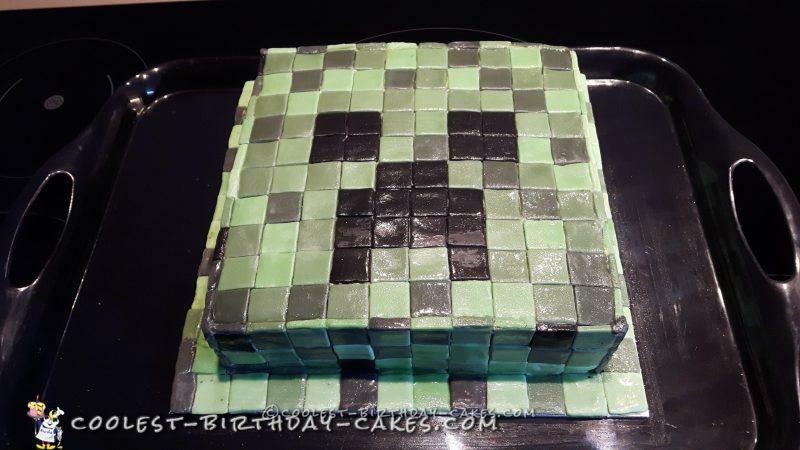 Carefully place the black tiles to make the creeper face. Mix various shades of green and add Tylo powder before rolling out to the same thickness and cut out the tiles. Place the green tiles in a mosaic over the rest of the cake. (Buttercream should not show). Continue down the sides and the board. I made some of the tiles more pliable and thick to even it up as it is impossible to get a perfectly square cake. Ribbon could help here. Smooth the tiles carefully using a smoother. Strips of icing may be needed to trim the edges of the cake to make it look neater. The black may look a bit dull due to the corn flour. When you are happy with the look you can gloss the cake. I used syrup : vodka 1:1 mix and painted it the night before, and it stayed nice the day after. This will bring back the shine to the black. Alternatively, you can steam or rub in fats to gloss the cake.